The event took place in Barcelona and brought about 250 people from the industry coming from Europe, United States and India. The event is dedicated to companies needing to adopt a paperless approach in their scientific data management throughout the product life cycle. We decided to focus this year’s edition on the Internet of Lab things (IoLT) with the title "2020 Roadmap for Digital Convergence - transforming scientific information into actionable insight". The event consists of a balanced mix of plenary and workshop sessions. The sponsors benefit an interactive workshop where they showcase the latest trends in methodology, systems and tools. Attracted by the chance to get to know the key players and the new comers, our visitors have several opportunities to network and interact with providers, peers and colleagues. This post event article aims to summarize the key concepts introduced and discussed along these two days through the plenary sessions and the 20 interactive sponsored sessions. The discussions went from the very beginning of the journey when a laboratory should start transforming its processes from paper to paperless or better say less paper. Pat Pijanowski, partner at LabAnswer explained that “transformational solutions start with a comprehensive data strategy”, highlighting the importance of doing the foundational work first, and assessing your current state of readiness versus the 6 different levels of a Maturity model of vocabulary & master data management. Once the transformational process has started, the requirements for connecting the instruments, integrating the systems and ensuring a seamless flow of the data between interfaces drives us to the compliance requirements such as data integrity. Multiple sponsored workshop sessions have covered these topics from different angles. Labware and Waters presented their own solutions and discussed about data integrity requirements and ALCOA+ definitions while iVention took the opportunity to share their customer experience with the support of an expert in auditing. The concept of IoLT is now becoming a new acronym for the industry, a derived approach for laboratories of the IoT that everybody is getting familiar with. The concept of data received directly from instruments, sensors, devices perfectly fits with the laboratory world, where the opportunities to create a seamless integration will be certainly driving the future of the scientific data management. Michael Shanler, Research Vice President Analyst at Gartner has perfectly set the scene of the IoLT concept in his presentation “Exploring The Digital Potential For Laboratory of the Future”. The future is already here, as several sponsors have demonstrated during their workshops. Cubuslab has specifically presented a platform which allows the implementation of IoLT today. Michael has emphasized that we shouldn’t confine IoT to a single domain as the big digital potential is in new business models with converging ecosystems. Gartner’s Research VP also analysed the elements and uses of AI-assisted Lab and Business Processes. Shanler described the IoT ecosystem as follows: IoT in Labs is at the core of the ecosystem and is related to Industrial Internet of Things (IIoT) through quality manufacturing while is linked to a series of elements through research and development, such as Smart home IoT, mHealth (HC/Fitness) and dClinical (drug trials). At the same time, Smart home IoT is related to Connected car IoT, and Energy Utilities IoT. And, of course, IoT in Labs and Industrial internet of things (IIoT) are converging ecosystems. Mark Newton, Senior Consultant-QA at Eli Lilly, key contributor of the ISPE GAMP working group, has helped the audience to evaluate the data integrity challenges associated with the use of systems generating a large amount of data like a chromatography data system, “Manipulating Chromatography Data for Fun and Profit” It’s clear that these systems are nowadays under the scrutiny of several investigations and audits. At the same time, we believe that the major providers are making significant steps to support their clients in ensuring the data integrity throughout the entire data life cycle. Kurt in Albon, Global Head of Quality Assurance at Lonza took us to data governance, approaching the challenge from the managerial point of view. The human factor remains one of the most critical aspects of the projects. The data governance approach ensures that all employees are engaged in the successful implementation of the data governance, starting from the senior management which should instil the culture to the operators who are generating, analysing and submitting the information. Sofie van der Meulen, Attorney at Axon Lawyers, key note speaker of the event in the last years, always bring very interesting insight from the legal perspective. The IoT introduces new legal challenges, as the devices are now able to collect a huge amount of data, including private information. We believe that the ability to handle this large amount of data in the most appropriate manner in terms of privacy will be a key differentiator for the future, particularly in R&D environments. Louis Halvorsen, Chief Technical Officer at Northwest Analytics developed for the audience the concept of EMI and the design principle of the industry 4.0. We have found this presentation as the perfect summary of the opportunities that proper “paperless” data management can bring to the industry, allowing the sharing of R&D, production and quality information in a simple manner. Several other presentations have highlighted very interesting aspects of the scientific data management, including how research and academic organizations can be supported by “paperless” projects. Prof. Thomas Friedli, Professor for Production Management and Director Institute of Technology Management at St. Gallen University, has introduced the audience to an overview of the operational excellence concept. His organization can provide insightful information on the laboratory performance, thanks to a consolidated benchmarking analysis based on one of the largest databases worldwide. We believe that the operational excellence is becoming more and more one of the cornerstones of the future labs. The evaluation of the performance against a large amount of peer organizations is the perfect tool to help the laboratories to focus on key areas that can be optimized and enhanced. We have been pleased to present the results of the ELN (Electronic Laboratory Notebook) survey which has been designed with the collaboration of Scientific Computing World. ELN remains one of the critical tools to be implemented in the industry, from research to development and subsequently in the production stage. Academic organizations are also using very frequently this type of application. We´ll soon release a comprehensive summary of survey outcome and the full results will be made available upon request. The presence of sponsors has been extremely positive during this edition. It demonstrated the importance of the event for the companies which are having an interest to present their capabilities, new products or future trends. Beside the companies which are having a long history of success in this market, new companies have joined the PLA2017. This expansion is giving us high confidence that the congress will continue to attract even more people in the coming years. While the presentations have been a very well appreciated part of the congress, the 20 workshops allowed attendees to have direct experience with specialized computer solutions in the sector and get a first-hand view of their functionalities. This large number of workshops has allowed to cover a full range of topics and get in contact with very well-known companies operating in this industry and new enterprises which are approaching this market with new ideas, new technologies and fresh approaches. Labware, ThermoFisher Scientific, Perkin-Elmer, Waters, Biovia and Abbott are very well known companies in this field. They have provided their view on different aspects of the scientific data management, from data integrity (Labware) to lean processes (Abbott) going through a complete new view of lab data management (Thermo-Fisher). ELN capabilities have been covered by Perkin-Elmer launching at our event their new SignalsNotebook. The concept of archiving data has been developed by Waters, while Biovia has focused on a new tool called Discoverant, capable to provide a full overview of the scientific information. Mettler Toledo has also focused on data integrity, even if their perspective is always extremely interesting as it focuses on the bench and the data generated by the instruments. The product offering around traditional tools for laboratory data management is now enriched by the proposals of companies that have recently entered in this market, like Agilab from France proposing their paperless approach to document management using a very modern user interface based on Oracle and easily deployable on premises and in the cloud, ICSA a Spanish provider that focused on environmental monitoring, both from the hardware and software point of view or Kneat Software that is offering a very modern solution for system validation. Lonza has proposed their solution for paperless in the specific area of environmental monitoring where they have become a de facto reference. IDBS and iVention have given their respective proposal to address the cloud implementations with attention to data integrity. Specialized consulting firms like Spreitzenbarth Consultants and Osthus and software/consulting partners like iCD and BSSN have proposed their experienced approach to the different topics covered in the two days event, like process management, paperless and data integrity. Research activities have been covered in three different workshops sponsored by Collaborative Drug Discovery, Core Informatics and Dotmatics. CDD has dedicated the workshop to the concept of “collaborative technologies” combining traditional tools like ELN with others to create a collaborative environment to share resource data. Core Informatics has introduced the concept of the “Platform for Science Marketplace” which allows a simple approach to the implementation of research workflows, connecting Core’s platform with other systems in a simple manner. Dotmatics has focused on the specific workflows of antibodies, which are becoming a critical aspect of research activities. The solution proposed is able to generate full integrated workflows using the core capabilities of their products. 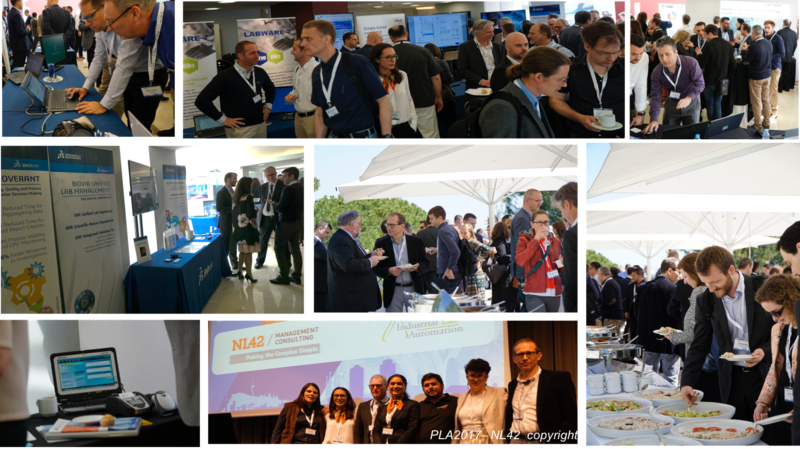 For the third year, the event took place at the Rey Don Jaime Hotel, in Castelldefels, near Barcelona in a beautiful environment by the sea where the attendees have enjoyed the atmosphere and networking opportunities. 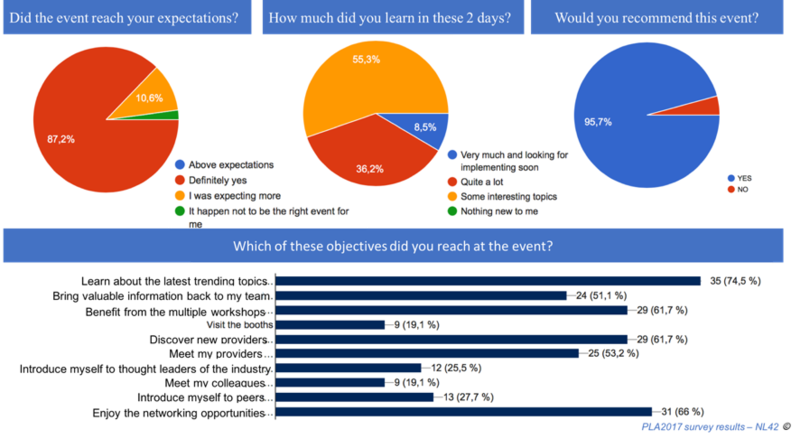 The satisfaction survey outcome confirms that the three pillars rich content, non-commercial presentations, showcase workshops and enjoyable networking sessions, make this unique event, and are acknowledged by sponsors and visitors as the key combination for one of the best European event in its category. To conclude with where we started at the PLA2017, this event is organized by Peter Boogaard, Isabel Muñoz-Willery and Roberto Castelnovo, yet none of us are event organisers! Three independent consultants with strong domain knowledge, consolidated international network and managerial skills which have permitted us to build an event with increasing notoriety and reputation over the years. We´re thankful to the 2017 sponsors to allow the “last but not least” key differentiator of this event, which is free entry to visitors from the industry. Founded in 2013, NL42 is a dynamic consulting firm that operates at European level, specialized in helping companies to adopt a “paperless” approach to scientific data management. As independent consultants, we offer our expertise and business vision to support companies that are looking for adopting digital transformation approaches. Organiser of the annual European congress Paperless Lab Academy.